The hair follicle mites of the genus Demodex (Demodecidae) were first discovered in humans in 1841. Since then, members of this host-specific genus have been found in 11 of the 18 orders of eutherian mammals with most host species harboring two or more species of Demodex. Humans are host to D. folliculorum and D. brevis. 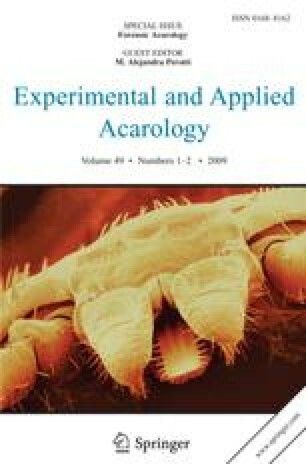 The biology, natural history, and anatomy of these mites as related to their life in the human pilosebaceous complex is reviewed. This information may provide insight into the application of Demodex as a tool for the forensic acarologist/entomologist.